Children’s furniture designer Casa Kids has just announced a new stylish homework setting for kids of all ages, though parents beware, because you’re going to want this desk all to yourself. 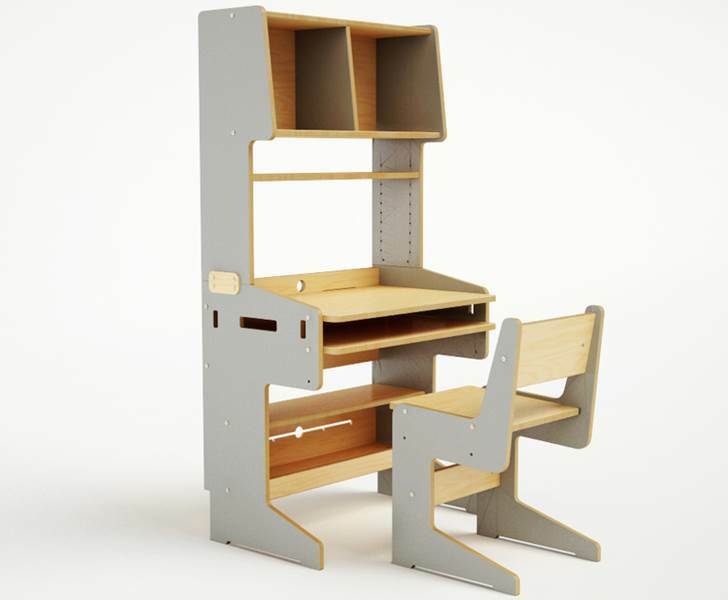 The new ConnectMe Desk and Chair is a computer desk and chair combination featuring an adjustable desktop and chair height, as well as the high quality, sturdy materials and ethical building practices that have come to define Casa Kids’ furniture. The ConnectMe desk’s desktop allows for easy adjustments into two positions – the high setting works for bigger kids and most adults so this desk is perfect for little ones all the way through college. Rear wire holes and a low shelf for placing routers, surge protectors and wiring ensures that desk clutter stays to a minimum, while two handy shelves above the desktop offer plenty of space for storing books, supplies, folders and more. The ConnectMe chair offers two settings, like the desk, with the low setting being ideal for most six to ten-year-olds, and the high setting works for ages ten to adult. This desk is available in three color schemes: all-natural Baltic birch; all-natural with gray accents, or all-natural with white accents. Casa Kids uses certified FSC baltic birch plywood, zero particle board and water-based, non-toxic, low-VOC finishes for their products, so beyond being stylish and long-lasting, this furniture is safe and eco-friendly. The set ships flat and is very easy to assemble. Children�s furniture designer Casa Kids has just announced a new stylish homework setting for kids of all ages, though parents beware, because you're going to want this desk all to yourself. The new ConnectMe Desk and Chair is a computer desk and chair combination featuring an adjustable desktop and chair height, as well as the high quality, sturdy materials and ethical building practices that have come to define Casa Kids� furniture. The ConnectMe desk's desktop allows for easy adjustments into two positions - the high setting works for bigger kids and most adults so this desk is perfect for little ones all the way through college. Rear wire holes and a low shelf for placing routers, surge protectors and wiring ensures that desk clutter stays to a minimum, while two handy shelves above the desktop offer plenty of space for storing books, supplies, folders and more. The ConnectMe chair offers two settings, like the desk, with the low setting being ideal for most six to ten-year-olds, and the high setting works for ages ten to adult. This desk is available in three color schemes: all-natural Baltic birch; all-natural with gray accents, or all-natural with white accents. Casa Kids uses certified FSC baltic birch plywood, zero particle board and water-based, non-toxic, low-VOC finishes for their products, so beyond being stylish and long-lasting, this furniture is safe and eco-friendly. The set ships flat and is very easy to assemble.